French Quarter Easter Parade, LLC proudly presents the 36th Annual Chris Owens French Quarter Easter Parade on Sunday, April 21, 2019 at 1:00 p.m.
New Orleans Tradition Celebrates Its 36th Year. Easter kicks off Saturday, April, 20 2019 at 7:30 pm with a night-time cocktail party with complimentary wine, champagne, soft drinks and hors d’ oeuvres at the Chris Owens Club, 500 Bourbon Street. There’s a show following, featuring Chris Owens; a one-woman dazzling, talking, singing, dancing, sparkling explosion of perpetual motion that sweeps the audience right into the tempo of the show! On April 21, 2019 Easter Sunday morning will begin at 11:00 am at the Omni Royal Orleans Grand Ballroom with a Silent Auction, Hat Contest, and music. This in no ordinary hat contest…local notables will be the judges! 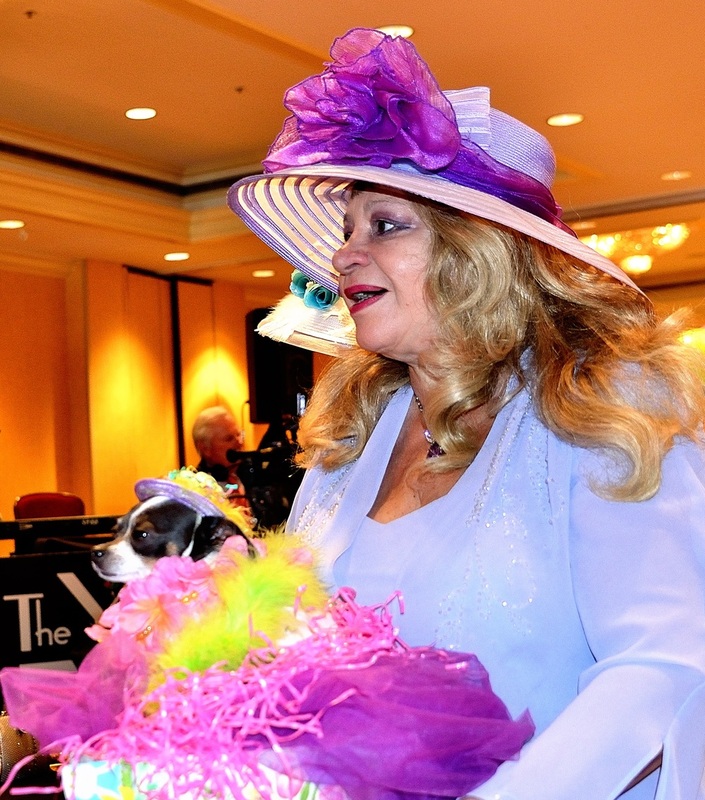 At 1:00 pm, the Grand Duchess of Easter in New Orleans, our own Chris Owens dressed in her personally designed Easter ensemble will lead the parade on a path through the heart of the French Quarter. The French Quarter Easter Parade will be honoring legendary New Orleans entertainers as we partner with New Orleans Musical Legends Park to make the festivities more spectacular than ever. Complete with colorful floats, marching bands, beads, Following the parade and back at the Omni Royal Orleans – there will be a private champagne brunch where the silent auction will continue with dancing to the The Yat Pack band. REGISTRATION due by March 15,2019 Float loading is on April 17, 2019 from 5-7pm at 1800 Tolendano Ave, Kenner, 70065. Please Select Ticket(s) Option, Fill Out Form, Attach & Mail Payment. We have an ongoing partnership with Omni Hotels to provide luxurious accommodations for our guests. Click here to book your stay. Chris Owens requests your consideration in contributing an auction item of your products or services for this year’s 36th Anniversary French Quarter Easter Parade festivities. The parade and the events surrounding it have become a tradition for many New Orleanians and their families. This year, the French Quarter Easter Parade will be honoring legendary New Orleans entertainers, and we will partner with New Orleans Musical Legends Park to make the festivities more spectacular than ever. We are keeping all of our long-standing traditions, including the silent auction which will help the Easter Parade raise money to support music education in New Orleans. We would like you to join us in contributing to this important cause, and we hope you will participate by donating an auction item for this special event on Easter Sunday, April 21, 2019 beginning at 11:00am. In return for your participation, you will receive acknowledgement of your company in the event program and signage. The celebration starts at the Omni Royal Orleans Grand Ballroom at 11:00 a.m. with a Hat Contest and music. We will then hop on the floats and ride through the French Quarter. Following the parade, the fun continues with a Champagne Brunch and dancing to the Yat Pack. A photographer will also be available to take pictures of children and other participants. We hope that you will join us in making this year’s parade bigger and better than ever. Your prize is sure to make it an Egg-straordinary Easter! For organizational purposes, please print, fill by March 31, 2019. Parade rolls at 1pm on Easter Sunday from the Omni Hotel. Become Part of a New Orleans Tradition! Chris Owens invites you to join us for the 36th Annual Chris Owens French Quarter Easter Parade. Become a sponsor of this year’s Easter Parade and make a New Orleans tradition even bigger and better! A total of 15 tickets for the Champagne Brunch (after the parade). We hope that you will join us in working with the community to successfully complete this initiative. The Chris Owens French Quarter Easter Parade, LLC. For additional information, please contact us by email.